Chelsea are ready to sign Philippe Coutinho if their transfer ban is lifted this summer. Spanish newspaper Sport claim the Blues are keen to spend – if allowed – and Coutinho tops their wishlist. Chelsea feel Coutinho would be the ideal replacement for Eden Hazard, with the Belgium international expected to join Real Madrid. Manchester United were also linked with Coutinho, however, Sport say the Red Devils will not sign the former Liverpool man this summer. Man Utd have agreed to talk with Paul Pogba about his future in a month’s time amid interest from Real Madrid. Spanish daily Marca claim United have scheduled talks with the France international next month. Real Madrid are ready to splash the cash this summer – and Pogba is near the top of their wishlist. The Red Devils are hopeful that their star midfielder will stay at the club. Real Madrid will have to pay £130million to sign Liverpool star Sadio Mane. El Confidencial say Zinedine Zidane is a big admirer of the Senegal international, who has impressed at Anfield this season. However, Liverpool are ready to demand £130million for their star man. El Confidencial add that Eden Hazard, Paul Pogba, Christian Eriksen and Mane are all being eyed by the Spanish giants. Arsenal are readying a move for Burnley ace Dwight McNeil. The Daily Star say the Gunners are one of four teams after the 19-year-old. Manchester City, Everton and Newcastle are also keeping tabs on McNeil, who has netted three goals and chipped in with five assists this season. McNeil is under contract at Burnley until 2023 having put pen to paper on a new deal in January. Rafael Nadal: What time will Nadal play Jan-Lennard Struff at Barcelona Open today? 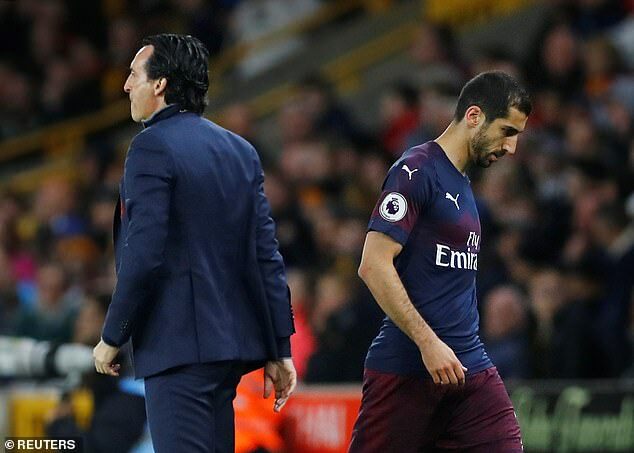 Arsenal’s soft underbelly remains under Unai Emery on the road… they have claimed an incredible 22 points less away than at Emirates and have conceded one more than Cardiff! We are, it seems, constantly wrestling with the notion of Unai Emery’s Arsenal being better than the one he inherited from Arsene Wenger. You only have to look at their away performances to reach the conclusion that very little has changed. The ‘soft underbelly’ we called it in Wenger’s day, a vulnerability when the going got tough. And so it remains the case under Emery. If Arsenal’s greatest Premier League side won the moniker ‘The Invincibles’, how about ‘The Invisibles’ for the current vintage when they leave the comfort of North London? They were a shambles during Wednesday night’s 3-1 defeat at Wolves, conceding three times in 17 minutes before half-time, and this after a promising start. 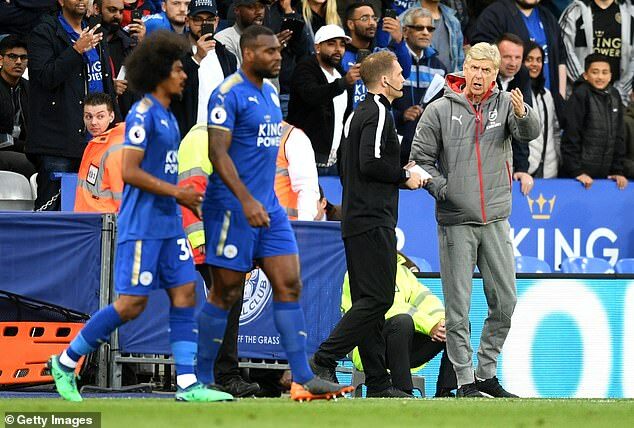 Emery cannot realistically lay claim to improvement when his side are repeatedly capable of such performances on the road. And for all the talk of systems and formations, it remains the suspicion that personnel are the underlying cause of their dismal away form. 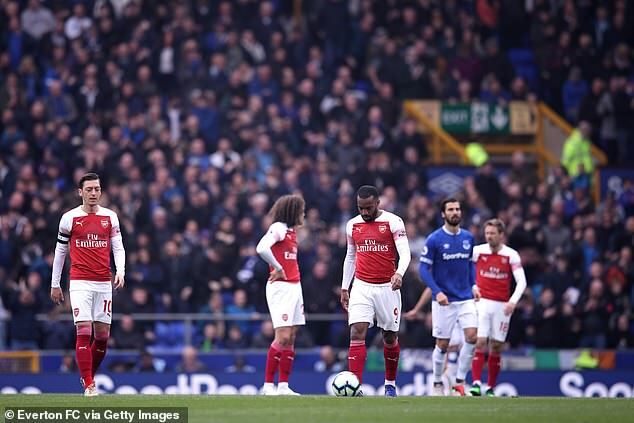 The likes of Mesut Ozil, Henrik Mkhitaryan, Granit Xhaka and Alex Iwobi aren’t the first names you would associate with resolution, sweat and tenacity, qualities often needed in a division where you have to earn the right to play away from home. 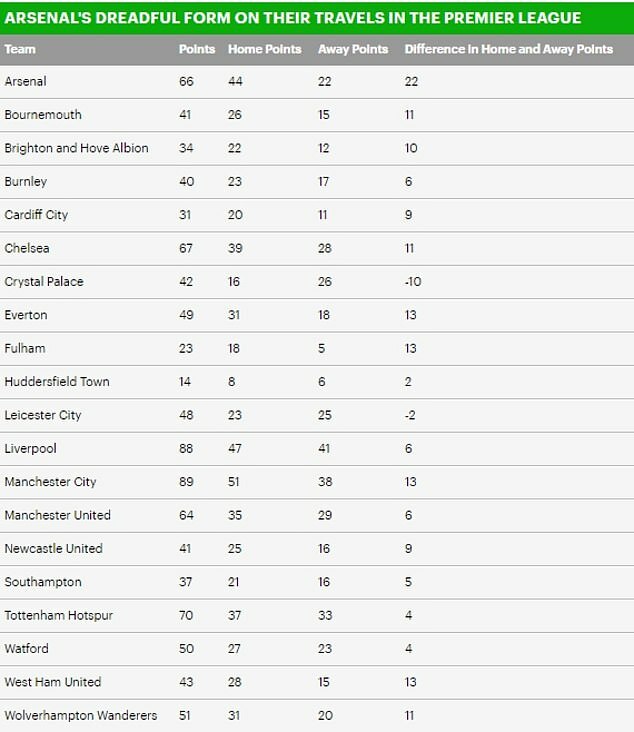 The league table on away results alone has Arsenal in ninth, beneath Crystal Palace, Watford and Leicester respectively, and each of their top-six rivals. The 31 goals they have conceded from 17 games is one more than Cardiff and equal to Brighton, the two teams left scrapping it our for survival. That demonstrates the level they are at when removed from the cosy surrounds of the Emirates Stadium, where their home record is bettered by only title contenders Manchester City and Liverpool. Wenger signed off last season after seven straight away defeats, the club’s worst run since 1966. It was not as if Emery was in the dark when it came to identifying flaws and areas for improvement. He has tried four at the back and a three-man defence, using wing-backs to push forward and exploit the space created by their inside forwards. It is Arsenal, however, who have found themselves exploited. They lost heart at Wolves after a decent opening in which they pinned the hosts in their own half but could not find a way through. Their passing became sloppy, decision-making unfathomable and application reduced, all trademarks of the away-day demise under Wenger. 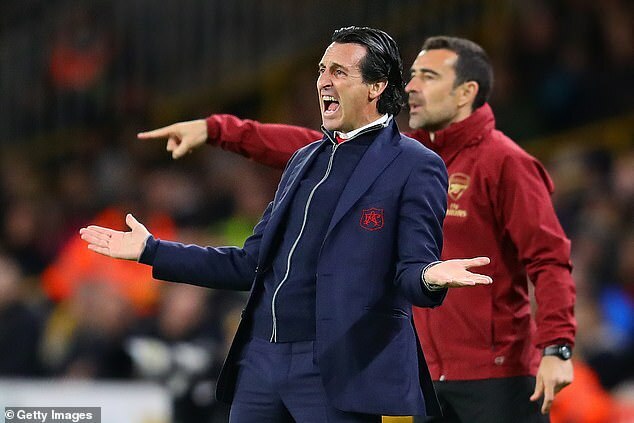 It is this that will cost Arsenal a place in the top four and undermine Emery’s hopes of progression, especially given the loss of Champions League football as an attraction for would-be recruits. Speak to Arsenal supporters and they say it is a lack of leadership that is their biggest weakness away from home. Where, they argue, are the standard-bearers whipping others into line when interest wanes as games slip away? And that is why it comes back to personnel. Ozil, in particular, has come to define the wishy-washy nature of modern-day Arsenal. There is no longer a fear-factor when the Gunners roll into town, the trepidation is all theirs. Sportsmail columnist Martin Keown is back to answer your questions ahead of a busy weekend of action in the Premier League. Manchester City and Liverpool are going toe-to-toe in the battle for the Premier League title, while below them teams falter in their challenge for the top four. 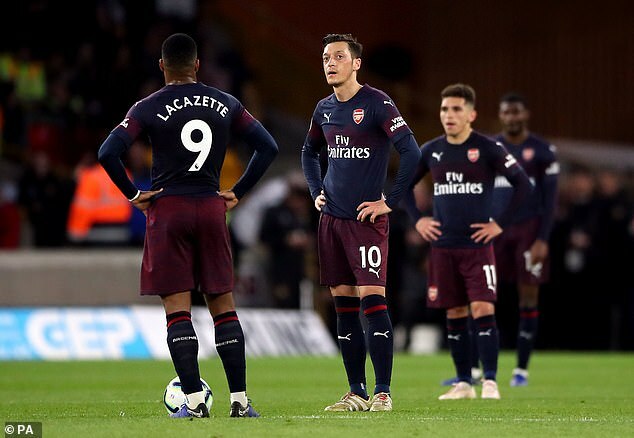 Martin’s old side Arsenal are one side who are going through a blip in form, and the Gunners are just one of the subjects being tackled by our columnist this week. If you are using the MailOnline app, please click HERE to view the live blog. Eric Bailly – Should Arsenal sign this Man United reject? When I first saw the Eric Bailly to Arsenal rumour my initial thought was no way, we do not want or need another Manchester United flop, however, on reflection, I am of the opinion that he may well be worth signing. I watched Bailly against Paris St Germain and he was woeful but he should not be judged on just that one game because if that was the case we would have no team left after the games against Everton, Crystal Palace and Wolves. The Ivory Coast international has clearly not had a great time with United since signing for them three years ago for a cool £30 Million but let’s be honest, they are a dysfunctional lot at Old Trafford and players that have failed up there over the last few years can be given another chance under the right circumstances. United signed Bailly when he was just 22-years-old, well away from his prime and still a work in progress, he was bought for a significant sum of money and by all accounts was a success in Spain with Villarreal. What this means to me is that we can sign a player that can easily recapture his previous form for a sum of money far less than what he is probably truly worth and that our manager is familiar with him from his time in Spain as the Sevilla manager. We clearly need defenders I am not sure anyone would disagree with that and as Bailly is right now he is not an obvious choice but his age, raw talent and value makes him a player we should seriously consider buying.